Content Marketing, the term didn't exist 12 Years ago - let's review - We used to create a 10 second TV ad to send consumer to a website to fill out a form. We've evolved into industry, job level, geographic filters, rather than simply send the inquiry to IT. The precision of targeting has become so much more sophisticated. There is then a splintering of attention. We are talking MICROSECONDS for the initial and ongoing conversations. "The noise and clutter are at insane levels." NetLine addresses the HUMAN side of business. Problem-solving centric. You speak to the millisecond mindset. Perhaps you convey this with an image that displays the problem-solving you will do for them in the ONE glance to get them to stay and read more or take another action. As you've grown in NetLine, what have you learned? "DELEGATION is key. People take it for granted that it's easily done. This is something that would impede my success if I insisted on controlling all aspects. This includes being more communicative in my team and with our partners." 9:45: Where are you seeing some of these things going - precision of campaigns, splintering, attention span? "This backs into the stage of the consumer lifecycle. Video is certainly really hot right now, but it's not predisposed to lead generation." He also covered infographics, user expectations that a lot of this should be ungated. eBook success has been huge. If they are done well, they take complicated topics and distill them into humanized value points with more personality." This is the evolution of whitepapers. To get more "where we were, where we are going" insights, listen to the full episode. 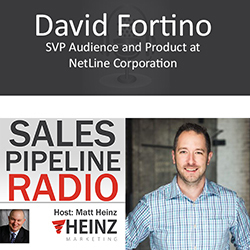 David Fortino, SVP Audience and Product at NetLine Corporation brings a wealth of expertise in developing strategic distribution partnerships. His core strength lies in expanding targeted and contextually relevant audiences through strategic relationships and channel partnerships spanning leading industry marketplaces.